Happy Monday! Did you have a good weekend? I celebrated my birthday with some friends on Friday and then spent the rest of the weekend relaxing! Thank you for all the birthday love last week! It was one of the better birthday's I've had, I'm excited for what my 27th year has in store! It should be no secret that I'm loving off the shoulder shirts right now, so adding this one to the collection was a no-brainer. It's super lightweight and perfect for summer. I usually size up with Shein, however that was not needed with this shirt. I'm wearing a medium, but definitely should have gotten a small. It's one of those perfect comfy shirts that's easy to throw on and you're good to go. 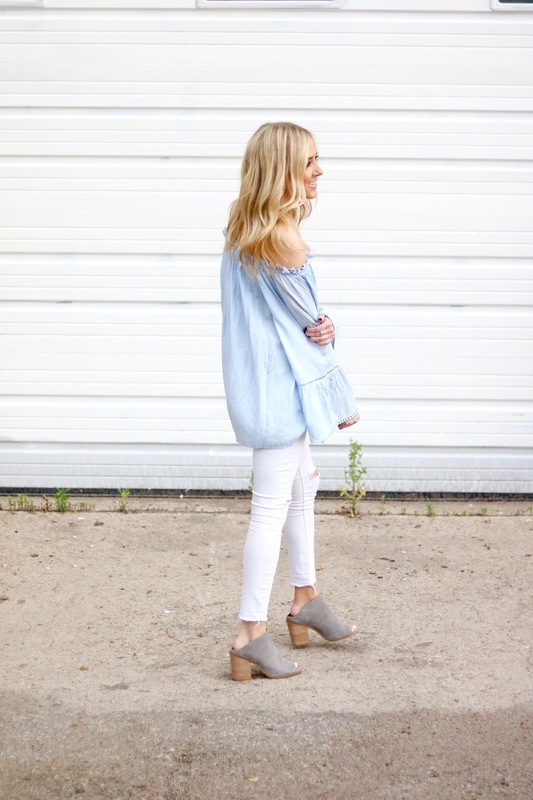 These jeans have been a closet staple for the last year. I actually had to get a second pair because I wore my first pair to death. The perfect distressed white skinny jean in my opinion. And these shoes - they're new to my [ever growing] collection. I absolutely LOVE them! I was nervous about the mule trend (mainly because I'm clumsy and thought they'd fall right off my feet) but so far no issues! They're super comfy and can be dressed up or down.